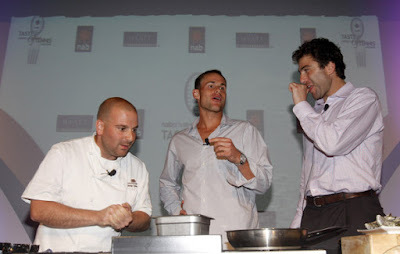 Andy Roddick joined by fellow American Justin Gimelstob in tasting the oyster cocktails of the Press Club restaurant's George Calombaris. The dry ice cocktail made him breathe smoke out of his nose and mouth. Gimelstob was quick to publicly point out the aphrodisiac properties of the shelled treats to Roddick whose fiancee Brooklyn Decker, a Sports Illustrated swimsuit model, arrived in town on the weekend. Fernando Verdasco, Tommy Robredo, Andre Sa and Aleksandra Wonziak also joined the fun at the inaugural Australian Open tasting, which has become a regular event at the US Open in New York blending tennis aces with super chefs. Looks like they are now bringing the fun to Australia.